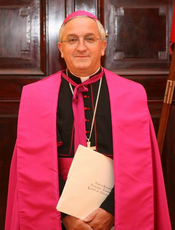 On May 28, Pope Francis of Rome appointed Archbishop Celestino Migliore as the Apostolic Nuncio to Russia. He is a doctor on Canon Law and worked in many international organizations, he was a Special Envoy to the Council of Europe, a Permanent Observer to the United Nations worked in the State Secretariat of Vatican in Africa, USA and from 2010 was a nuncio in Poland. The nuncio told an Interfax-Religion correspondent in his first interview after the appointment about his attitude to Russia, successes in studying Russian, tasks at his new post, international environment, and possibilities of new meetings between the Pope of Rome and the Patriarch of Moscow. - Your Eminence, what are your feelings about arriving to Russia? - Ministry in papal representations is based on the spirit of Exodus: "your belt fastened, your sandals on your feet, and your staff in your hand." Any nuncio knows that his ministry lasts about six-seven years. I have changed the ninth place of ministry in 35 years and I am used to take my job, plans and friendship both deeply and distractedly at the same time. This attitude perhaps is the hardest art that I could learn, it gives you a chance to live in peace with yourself and other people and be fully realized. - What is Russia for you? Is Russian mentality, Russian culture is close to you, an Italian? Do you have favorite Russian writers, composers, movies? - More than a thousand-year history of Russia attracts me, various peoples coexist and interact in it, it has a succession, historical, cultural and political turns, versatility of culture, literature of great, epic scale, deep religiosity. This is what I have taken from reading novels of great Russian writers, from music rooted in bylinas, folk roundelays, hymns of the Russian Orthodox Church, from theological thought of Vladimir Solovyov and Pavel Florensky. I read Three Conversations and A Short Tale of the Antichrist by Vladimir Solovyov and Pavel Florensky. Among works by Pavel Florensky is Iconostas and fragmentarily The Pillar and Ground of the Truth, which I believe to be a fundamental work of the Russian religious thought. - What is your personal attitude to Russian Orthodox tradition? What Russian cities and shrines would you like to visit? - I got some impressions from reading and communicating with people belonging to the Russian Orthodox Church. Certainly, I have always been impressed by its great mystical inspiration, its deep feeling of the Liturgy, and conviction that Christianity can not be reduced to the set of values, but a personal meeting with Christ is its core. - Have you made progress in learning Russian? - It is not easy as it the first time I get acquainted with the Cyrillic, it is going to take some time to master writing and reading. However, I am inspired with this work. - What tasks Pope Francis set before you after appointment to Russia? What do you consider your priority at the new post? - I understand that the pope's expects and it is the task of his nuncio to be flexible and open in order to build bridges between diverse or even distant from each other views and formulations and walk along together the way Pope Francis and Patriarch Kirill did during their recent meeting on Cuba. - You worked in many international organizations, you were a Special Envoy to the Council of Europe, an Observer the United Nations. What do you think about the situation developing at the international arena, role of leading states in creating and overcoming tensions in the world? What is your opinion as a pastor and diplomat? - There are levers in international law that allows not only regulate relations among countries, but set up conditions for observing human rights. Nevertheless, when we sit at the table and discuss a question, a problem, a situation of emergency, then national interests often connected with economic, political and ideological interests, dominate. In such difficult moments good political will allows launching mechanisms of decision-making for the common good. It is a problem of culture and perception of the world, which suggest a long, but secure way. - What is your attitude to economic sanctions against Russia? Is it in Vatican's plan to apply efforts in order to normalize relations between Russia and West? - I remember that about twenty years ago the Holy See cooperated with Russia at the international scene to bring the regimen of sanctions into restrained frames and work out mechanisms of monitoring, so that sanctions do not punish population. - Which threats and challenges for Christian world are the main? - One of the tragic threats, that is widely discussed today and it unites the Orthodox Church and Catholic Church in strive to fight against it, is persecution of Christians. Pope Francis has recently spoken about two ways of persecutions against Christians: there are evident manifestations with every day victims and there is another way of persecutions, "educated, dressed in cloths of culture, modernity and progress," that finally deprives a person of freedom, especially the freedom of conscience. Thus, a person is not persecuted for confessing the name of Christ, but fir his desire to live and witness to the values of the Son of God. - The first in history meeting of the Pope of Rome and the Patriarch of Moscow has international resonance. How do you estimate the results of this event? - Very positively. It was more important than anything else to make a gesture that can heal the injury of division and lay a foundation for the joint way. Any trip, even the longest, starts from the first step. - Can we expect a new meeting of primates of the Roman Catholic and Orthodox Churches? - In modern globalized world full of spontaneous and frequent meetings, we can't exclude it. In fact, Christian brothers and joint mission dictate a necessity to continue contacts started on Cuba. - What mutual initiatives Vatican plans to realize together with the Russian Church? - I think that I will give you more exact answer after my coming to Moscow when I contact and set up relations with my interlocutors.